Could small and beautiful be more powerful than big and brash? Most traditional campaign strategies say that we need to get our message out there as large as possible and in as many places as possible: big billboards, lots of flyers and a clear message of the expected response (buy this, do that) so that many will notice. We live in a world where so many people and organisations are vying for our attention. Is bigger always better? From doing small pieces of craftivism and running the Craftivist Collective my experience is that it’s the small pieces hung at eye-level or snuck into a wall that gain most attention with people and in the media. Why is that? When something is small viewers feel less threatened and they don’t feel preached at. I have taught myself (sadly) to ignore large billboards, flyers in magazines, and giant banners on the street because I feel they are overbearing and are invading my space. Our pieces are small, gentle and vulnerable. I’ve watched people go up to our small handmade craftivist creations with curiosity and excitement that they have found something that has had time taken over it. When we choose to react to something, we tend to be more open to its message and engage in it more retin a online pharmacy than if it is forced on us. I was forced to read “Of Mice and Men” in school and hated it; when I chose to read it later I sobbed over Lenny’s hugged pets. This voluntary engagement often results in people sharing what they have experienced with others. Companies kill for this type of peer to peer advertising! An example of the power of small pieces of craft comes from Chile where, under the dictatorship of Pinochet, women used small handcrafted tapestries to express their grief about the deaths or disappearances of their loved ones. They pieced their stories together and the Catholic Church sold the pieces to foreigners who smuggled them out of the country. 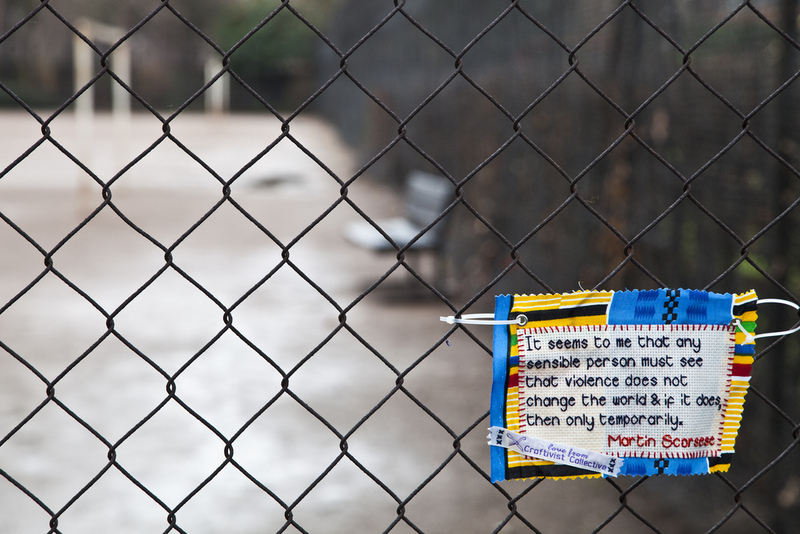 These little patchwork messages travelled the world, helped raise international awareness of the brutality of the Pinochet regime and Amnesty International used them to help build pressure to bring down Pinochet. 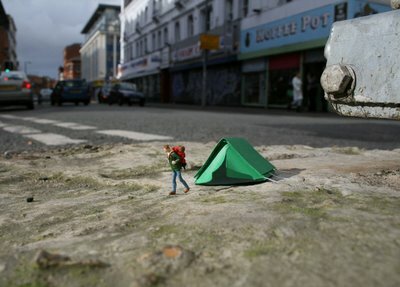 The success of British Street Artist Slinachu’s ‘Little People’ series shows that you can get a cult following from creating tiny installations. Our craftivist place their small creations in an area relevant to the issue but not in an obvious spot . Online we don’t broadcast in capital letters (which definitely feels like you are being SHOUTED at!) or say ‘check this out’ or ‘look at this’, but instead we quietly post our images somewhere relevant or as part of a bigger conversation. People come across our pieces rather than being given them on a plate & it’s led to many pinnning them on their Pinterest boards, commenting on the blogpost & even crafting their own piece. I believe that this valuing of something small and beautiful can help engage people in a deeper and more long-lasting way than shouting at people with a placard or giant banner, desperate for attention. What do you think? 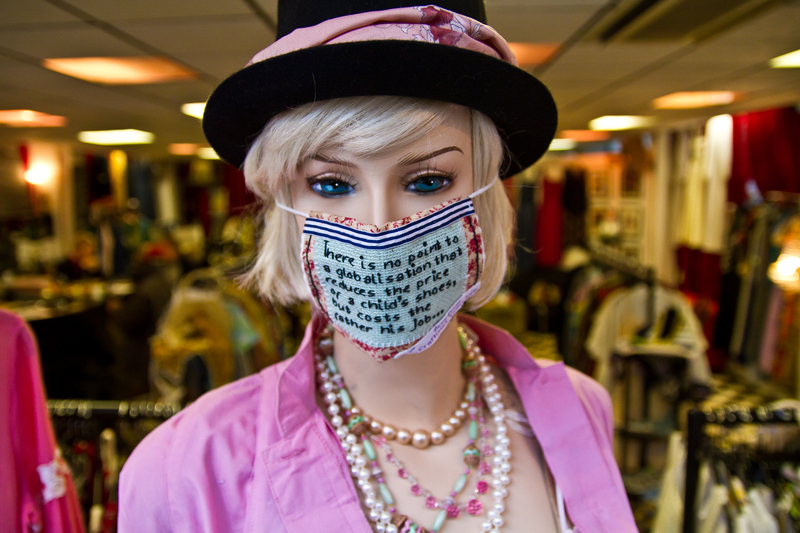 I love the idea of craftivism – small and quiet is good. I have started very small, I crochet on those paper cup holders people use for coffee (java jackets) just to remind them that they can be reused. We started in Santa Cruz CA but I travel in an RV so I am hoping to expand. Our Facebook page is https://www.facebook.com/pickmeuseme and the instagram is http://instagram.com/. It is amazing how many conversations this begins and how people seem to be delighted with this non threatening gesture of recycling. Hmm “how small is small?” is a good question Fatblackcatjournal I think for me it’s small enough that people feel excited that they have noticed it when others might not and feel excited to go up and find out what it says and which, in my yes, is the opposite to shouting on the streets and preaching at people. I feel that if people feel proud and curious about something they have ‘found’ they are more likely to engage with it on deeper & more open personal way than if its easy to see. interesting thought! and yes small pieces of street art do intrigue me more than large ones.